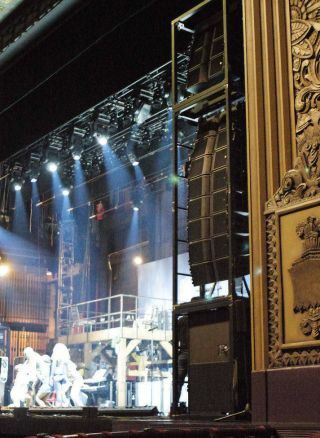 According to Associate Sound Designer Mike Tracey, the touring sound system for RENT comprises two main left/right towers of 11 Kara enclosures per side, as well as two SB18 subwoofers per side, arrayed in a cardioid configuration. Discreet coaxial 5XT speakers provide front fill, while two X12 coaxials provide down fill. This is all powered by six L-Acoustics LA8 amplified controllers in an LA-RAK and controlled via an LA Network Manager. Two spare LA8s are also in the rack but, underscoring their reliability, have yet to be used. Masque Sound, which also provided a Yamaha CL5 console for front of house, is the sound-reinforcement provider for the show. Tracey drew up the system design in L-Acoustics’ Soundvision 3D modeling software program using his team’s knowledge of the theaters that are on the tour itinerary. He is also a fan of L-Acoustics’ technical support. Mike Rukstad, the show’s FOH mixer and head of audio, says the Kara system puts RENT into the category of a rock concert as well as a theatrical show. Rukstad, who has also mixed Buddy: The Buddy Holly Story and Bullets Over Broadway on tour, says the L-Acoustics system is a high-fidelity experience for theatergoers.